In the last two weeks I have spent 4 days at the Mid Atlantic Quilt Festival and 4 days at the Wish Upon a Quilt retreat in Old Salem. Plus there was a quick trip to Charlotte for an APQS Road Show. Sorry I missed the last two Sundays but I wanted to get a post in today even if it is a little late. I would love to have everyone believe that my studio always looks like the ones in magazines. HA! This is a working studio, surfaces are used as stacking spaces, batting is everywhere. There is currently a roll of batting leaning against my french doors. I can only see a fraction of the mat on my cutting table and there is thread on every surface on. Cones waiting to be put away, stings everywhere. Yesterday I decided that the closet in my studio needed to be organized. I could open and close the door. Ok, I might have had to move stuff to actually close the door and the floor may have been stacked 3 feet deep, but it was hidden from my view. Last night I cleared out the floor of the closet. I threw a lot away, made piles to take to guild to donate to the charity drives and put everything I am keeping away. I can now walk right up to my customer quilts. 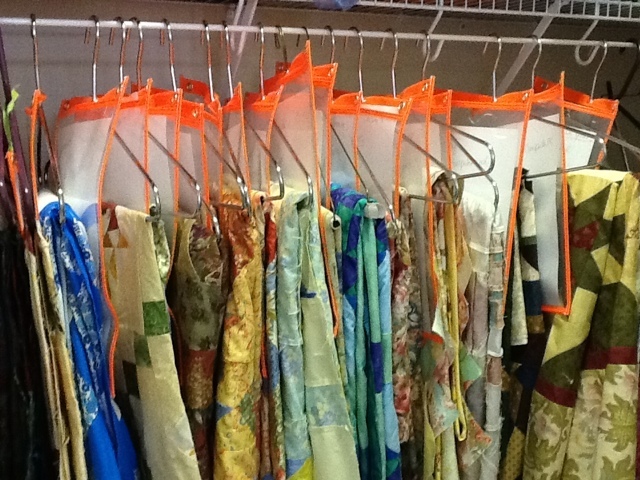 When I first started longarming I just grabbed some plastic hangers out of a closet and started using them to hang quilts on. 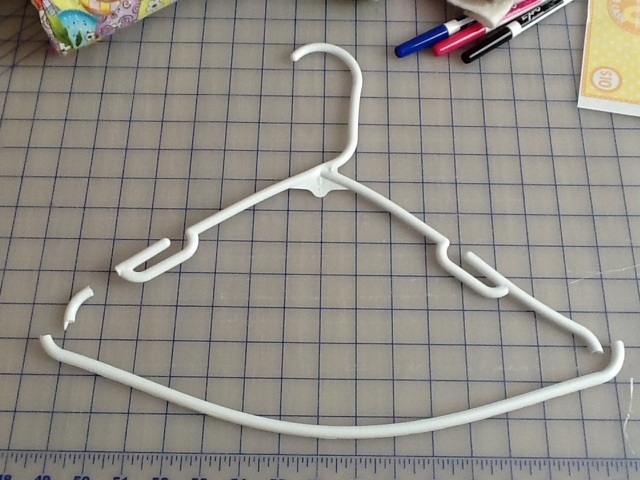 Want to see what a queen sized quilt can do a heavy duty plastic hanger? 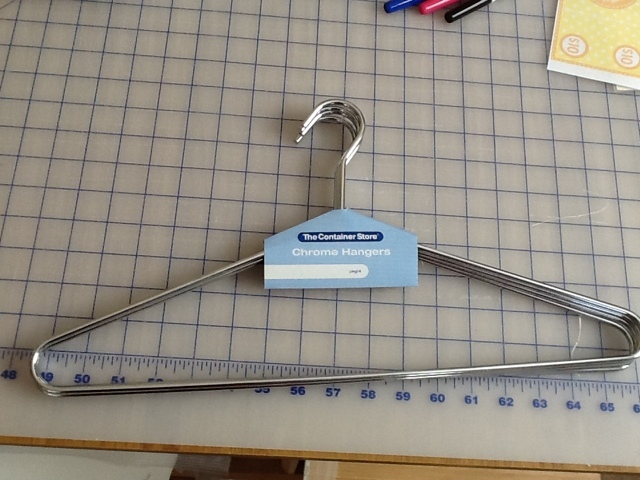 About a year ago I started purchasing Chrome hangers from The Container Store. Yes, they are on the expensive side, but they can handle the weight of the quilts. I actually ran out today and picked up 20 more hangers. I still do not have enough for all the quilts waiting to be quilted. I use work order sleeves from Uline. The grommet fits right over the hanger and I can put a full sized piece of paper in it. 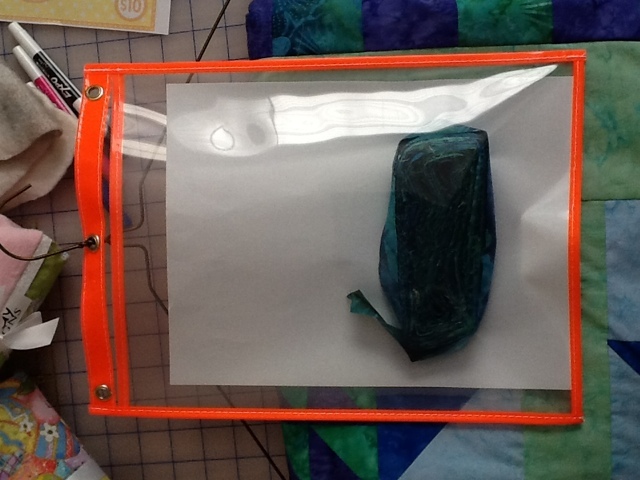 I also put the binding in it so that everything stays with the quilt. I love this system. I have been using it for my customer quilts for years and I am working on getting all my quilts organized the same way. Just look how nice it looks when with all the quilts huge. The scary things is those are my Mom's tops waiting for me to quilt them, mine are still on plastic hangers and my customer quilts are hung on a different wall. Guess it is a good thing I just ordered Quilt Path. I really need to get some of my Mom's quilts done. Lucky you... Quilt Path! I'm very eager to talk with you about it, can't wait to see more of your quilted creations. You will have to come over and play. I have been playing with the software, I can't wait to get the system and get it installed. I love how you organized the quilt tops. Thanks for sharing.